Winston or Mariota? "This is the most important pick, potentially, in the history of the franchise," Buccaneers GM Jason Licht told The MMQB. Of course, only one of those guys comes with his own baggage train. "Bad guy or immaturity?" Licht said. "I'm leaning toward the latter." Licht isn't about to tip Tampa Bay's hand, but the opinions of scouts since the start of the combine seem to have coalesced around Winston as the more promising of the two quarterbacks who could go No. 1. Though these things always have a hint of the herd mentality, it's not exactly clear what did it. Was it Winston looking fat, but turning out not to be? Was it a test on Winston's throwing shoulder, looking for the cause of potential weakness, reportedly showing nothing? Was it going nearly 10 months without running afoul of the law? Speaking on the phone with Peter King, Winston says he welcomes the scrutiny of his track record—not because all of it is already out there, but because he thinks it'll show him in a better light. "They're really going to find out the type of person I am. Character is not about what you do when you're around people. Character is what you show when no one is looking. 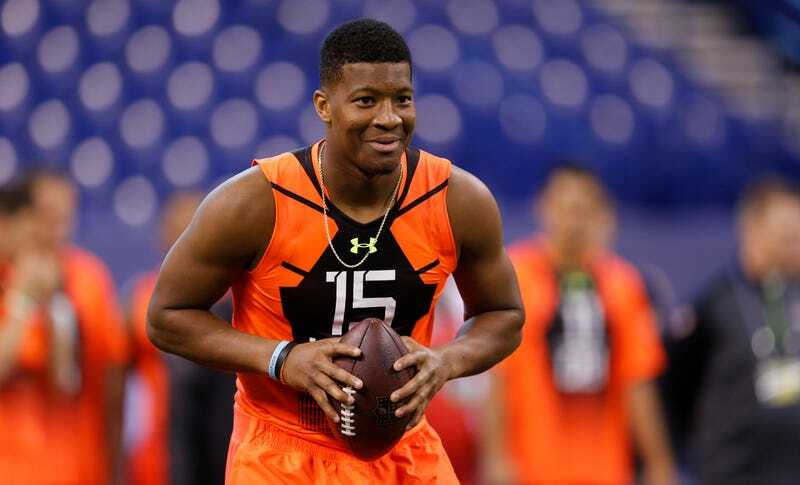 I believe if they do a hard, hard investigation into Jameis the person, they will find out that I'm a good guy." "Someone will take him in the first round, but how could you even let that guy in the building?" another scout said. "The second law of thermodynamics basically is the more ways something can happen, the more likely it is to happen. That's true of players. The more ways they can (expletive) up, the more chances they (expletive) up. This guy's got a lot of stuff that would lean him more likely to be a bust than a good player." Implicit in all of this dwelling on Winston's odds of shooting himself in the foot is that most think he'll be a better quarterback than Mariota, which I guess has more to do with his experience in a pro-style offense than the fact that he didn't look particularly good in 2014, and that against largely mediocre opponents. But it's dangerous to try to project just from college results (to say nothing of combine performance), so look forward to two months of character analysis.